Cash flow management is one of the most important tasks of running a successful business. When you manage the cash flow successfully, you will always have the right amount of cash ready at all times to manage your business for growth and profitability. As you may know, being a business owner, this can be quite a trick some times. 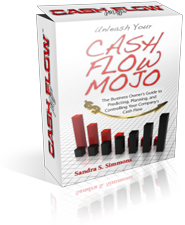 This is why our founder, Sandra Simmons, has developed the Cash Flow Mojo® Software – to assist business owners like yourself to have a tool that makes this task easy to do. When you manage cash flow efficiently, you, your staff, your suppliers, your customers are all happier because when you have enough money to operate the business profitably, everything about the business and the people working in it operate more easily to produce quality products and services that please everyone involved. Of course, we hope you decide to try out the Cash Flow Mojo software for your business. But maybe you want to find some more information before you do so. Well, here are some tips to give you a better idea of what is involved with this revolutionary type of cash flow management software. The resources listed below can be helpful to personally give you ideas on how to improve your own business and manage your cash flow. We hope you enjoy them. Sign up for the free Cash Flow Control Guide at the right by supplying your name and email address and we will send you this free guide download with tips on how to manage cash flow for your business. Get the 30-day trial of the cash flow management software by clicking the GET STARTED NOW button on the right to get all the features and training tips on how to manage cash flow included in the software package. Look over the page on Frequently Asked Questions https://www.cashflowmojosoftware.com/faq/ to get answers on how to best manage the cash flow for your business. Feel free to call us and tell us about your questions, comments, or concerns on how we can help your business (239) 331­-­7055.